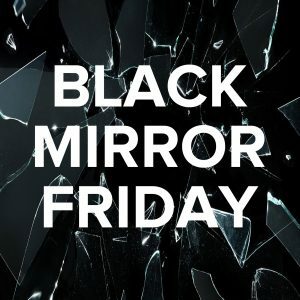 Welcome to our newest podcast series, Black Mirror Friday! Black Mirror is a British science fiction anthology television series created by Charlie Brooker. The show is an anthology with each episode typically standing alone. Set in an alternative present or near future, it examines modern society, particularly with regard to the unanticipated consequences of new technologies. The show originally ran for two seasons on British TV and was then purchased by Netflix, who ordered 12 more episodes of the show. Those episodes were split into season 3 (6 episodes, released 10/2016) and season 4 (6 episodes, released 12/2017). We anticipate a December 2018 release for season 5. But there’s another meaning. The idea behind this show is that technology can mirror and even magnify the ugliest – the blackest – parts of human nature. Will You Like Black Mirror? We’re here to help you answer that question. We typically get two reactions from people when talking about this show. I love that show! Did you know that season 5 is coming out soon? I tried watching it and couldn’t get into it. If you fall into that second category, we totally get it. Especially if you started with season 1, episode 1 (the one with the British Prime Minister and a pig – if you saw it, that’s all it will take to jog your memory). That was probably our least favorite episode and really not a good representation of the show overall. But the episodes that are good are really good and we guarantee you’ll be thinking about them long after the show is over. So, to help you out and to make sure you give this incredibly original, well-written, well-acted series a chance, we’re talking about all of the episodes (not necessarily in order) so you know what to watch and what to skip (if you want). We’ll have recurring segments rating each show and investigating the technologies and discussing how far off that tech might be. We’d love to hear your feedback on any Black Mirror episode! If you’ve watched, which is your favorite? Chat with us online @StingerPodcast everywhere.